This is a Rock Paper Scissors Game that was programmed using the visual basic programming language. 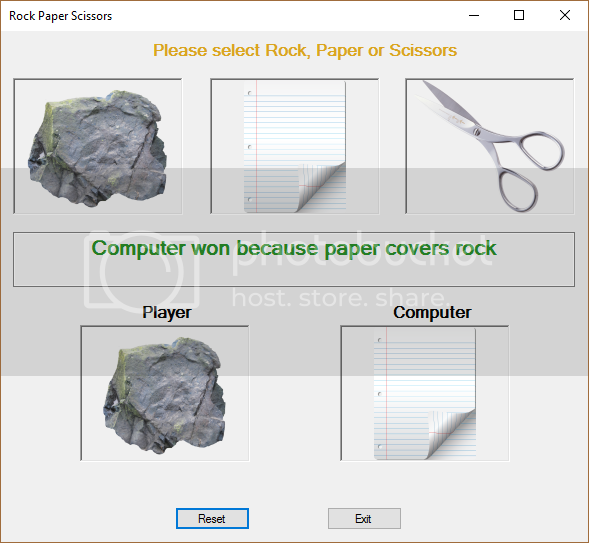 In this game the player plays against the computer, the player choose rock, paper or scissors from the option, then the computer rondomly choose from the same options. Based on what is selected by both players, the player determines who is the victor. If the same item is selected, it's a tie. If a rock and scissors are selected, the rock wins, because a rock can smash scissors. If scissors and paper are selected, the scissors win, because scissors can cut paper. If paper and a rock are selected, the paper wins, because a sheet of paper can cover a rock. txtWinner.Text = " TIE "
txtWinner.Text = " Computer won because paper covers rock "
txtWinner.Text = " Player won because rock breaks scissors "
txtWinner.Text = " Player won because paper covers rock "
txtWinner.Text = " Computer won because scissors cut paper "
txtWinner.Text = " Computer won because rock breaks scissors "
txtWinner.Text = " Player won because scissors cut paper "